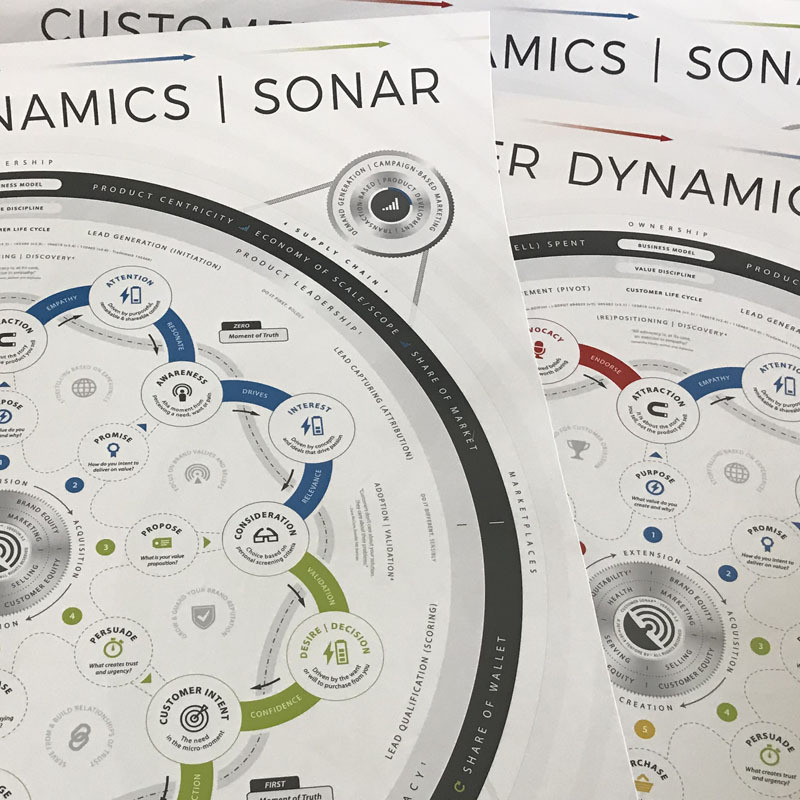 Official high quality poster DIN-A1 (594 x 841 mm) of the current Customer Dynamics SONAR™ framework. 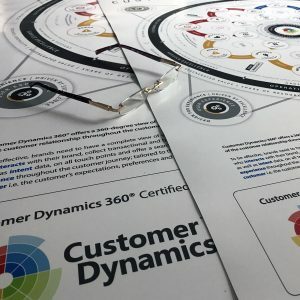 Customer Dynamics SONAR™ is a 360-degree, cross-silo, universal roundmap of the dynamics that forge strong customer bonds. The system is supportive of the lean business model and customer development method. Brands need to have a complete view of every customer who interacts with their brand and collect transactional, behavior and intent data on all touchpoints. Afterall, the perception of the brand (i.e. the identity) is the sum of all (shared) customer experiences on all touchpoints. Why the addition of SONAR? According to RadiumOne 84% of outbound sharing now occurs in dark social, making it increasingly harder to attribute traffic to the brand’s touchpoints. Bats use sonar (often referred to as ‘echo location’) to identify, follow and catch moths in pitch darkness. Brands will have to use similar techniques to mark, identify, follow and guide customers as they move around in dark social. Why is the system shared as a circle? The system aims to help brands to increase the number of retained, returning and referring customers, while acknowledging that a customer’s perception of future value, what we refer to as its significance to the customer, is as important as past and present experiences. 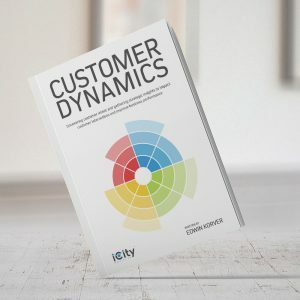 Why are the elements of the customer journey devided by a dashed line? A consistent (global) brand should offer a seamless customer experience throughout the customer life cycle, while tuning the voice of the brand towards the voice of the customer i.e. the personality of the brand versus the customer’s expectations, preferences and aversions. What are the outer circles for? While we started out to describe the customer life cycle we discovered strong interrelations between the four phases of the customer life cycles and past, current and new business models; existing and new value creation disciplines; old and new marketing strategies; and chain dynamics. To comprehend the Customer Dynamics SONAR™ we recommend our free online introduction training. Please apply for a free membership to follow this training in your own time. The poster is being printed on high quality 200 grams mat photo paper, in great definition and color. To keep the poster in prestine condition we send it to you in a sturdy, white mailing tube, with a brief instruction on how to read the Customer Dynamics SONAR™ and how to obtain more information.